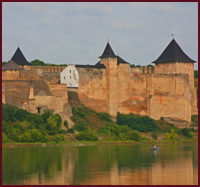 Regional centre in Ternopil’ region, situated on Nichlava river..
Borshchiv is known since 1456. The name, most probably, derives from the word “borshchivnyk” (English – cow-parsnip) – herbaceous plant, its young leaves and stalks are used as a condiment for green soups and salads. At the end of XV century more and more invasions of Turks and Tatars from Crimean Khanate began to occur on Podillya lands. Legend traces the name of the city to the one event of those times when the townsmen had drowned one Tatar in the cauldron with borshch (Ukrainian national soup). On these lands in the times of Kyivan Rus there were well-fortified defense settlements. From 1199 the settlement belonged to Halytsko-Volyns’ke Duchy. 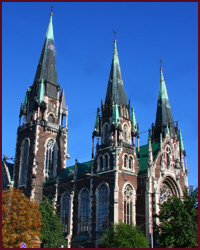 After XIV century it was owned by Lithuanian and Polish rulers. In 1629 Borshchiv was granted the Magdeburg right for self-government. The town got its coat of arms – golden sheaf with long coloured stripes on the background. From this time trade fair were often held in Borshchiv. At the end of XVI beginning of XVII century the town was owned by magnates Jerzy and Marcin Dydynski, then – Konstyantyn Zlotnitskyy. In 1672-1699 the town was ruled by the Turks. 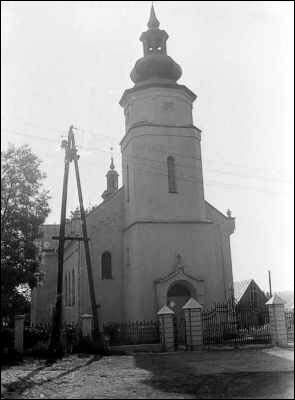 In May of 1774 legendary Oleksa Dovbush paid a visit to the town. Some narrations tell that with the help of servants opryshky got into the house of the Polish magnate. Magnate kneeled was asking for the mercy, but Dovbush told him that he didn’t come for the money and belongings, he came to take magnate’s life so people didn’t suffer any more. The town was owned by Poland, then after its division by Austria in 1712, Russian tsar empire in the period from 1809 till 1815 and Austrian-Hungarian empire from 1867. Borshchiv was rich with the talented people. Traveler S.Visnyovs’kyy, graphic artist Y.Hnizdovs’kyy, embroidery master H.Herasymovych, actor V.Yurchak, painter L.Levyts’kyy, singer M.Staryts’kyy, writer R.Andriyashyk were born here. Les Kurbas and Cossak brothers worked here. 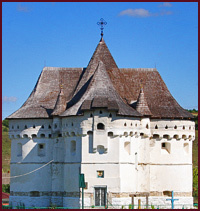 At the beginning of the XVII century castle was build in Borshchiv. On 10th of January, 1672 travelling here Ulrich Werdum wrote that it was surrounded by good ramparts and palisades. Then it was rebuilt into the palace. In 1763 a cathedral was built on the castle territory. 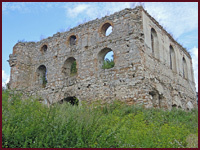 Built in XVIII century from the defense tower of XVII century. .